webOS 2.0 for Sprint images leak, voice-dialing coming to webOS! From a leak we feel dubious about to a leak that looks solid, Engadget has photos of webOS 2.0.1 running on a Sprint Pre. Exhibition mode is here but not fully working yet - just the clock works now, but more modes like photos, agenda view, and Facebook are in the works. This version is "Barley" with another called "Barleywine" in the works, both codenames we've seen dropped before. Apparently the OTA update won't come until the whole shooting match is updated to 2.1, which lines up with the 2011 release rumors we've heard as well. Looks like all the Sprint custom app are here, with one addition called "Sprint Music Plus" that we look forward to never using. 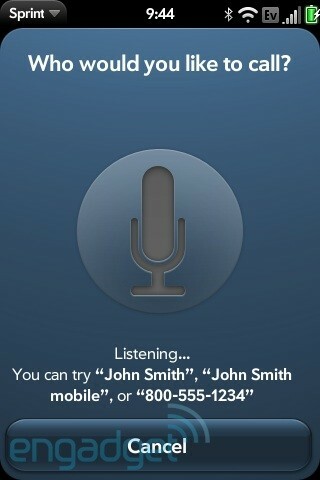 Also, it looks like there is a new voice dialing feature! It looks like the feature will search for contacts as well as accept straight-up numbers for those of you who actually remember those anymore.